Delicately processed black beans, refried with special spices for incredible flavor. 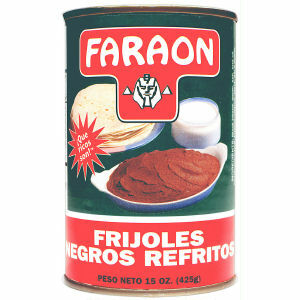 Faraon Refried Black Beans are made with an authentic Central American formula used for hundreds of years. This product has a multitude of uses: add to tostadas, serve with your favorite meats or simply as a pure and tasty vegetarian plate. Can be used in any plate that calls for refried pinto beans. Our refried black beans do not have any color additives or msg. Enjoy!